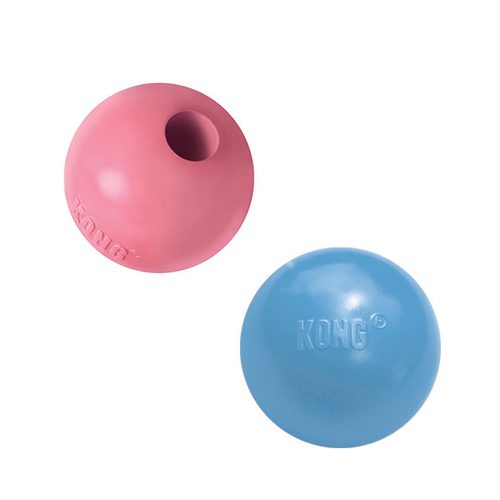 The Puppy Ball from KONG is ideal for your puppy's first fetching games. The ball is made of soft rubber that is not harmful to your puppy's teeth. The Puppy Ball is a puppy-friendly ball for your pup's first fetching games. The rubber has been specially designed to soothe sore gums caused by teething. It also teaches your puppy healthy chewing habits. The ball has a hole in the centre that you can hide your puppy's favourite snacks in. Medium/Large: 8cm diameter. Suitable for puppies weighing between 15 and 30kg. This product is delivered at random, you cannot select your colour. You will receive a pink or a blue ball. Have you used KONG Puppy Ball before? Let us know what you think about this product.